1st Run Computer Services, Inc.
Quickly capture a variety of documents up to legal size with the automatic document feeder. Scan photos, books and bulky items on this flatbed scanner. 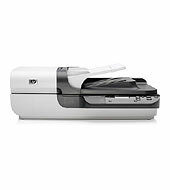 Plus, scan both sides of a page automatically, create shortcuts and manage scans with included software. Scansoft PaperPort is compatible with Windows 2000, XP and Vista. Presto! PageManager is compatible with Windows 2000, Windows XP, Windows Vista, and Macintosh OS 10.3 or higher. PC: For all systems: USB 1.1 or higher, CD-ROM drive, 800 x 600 SVGA monitor, 16-bit color, 60 MB (EMC ISIS/TWAIN drivers only), 450 MB free hard disk space (additional 500 MB and USB 2.0, recommended for extensive ADF use); for Windows XP Home and Windows XP Professional: computer with at least a 1.3 GHz processor and 512 MB RAM; for Windows Vista(R): computer with at least 1.3 GHz processor and 1 GB RAM; for Windows 2000: computer with at least a 800 MHz processor and 256 MB RAM. One-year limited hardware warranty, phone and Web support included. Warranty may vary by country as required by law. Go to http://www.hp.com/support to learn about HP award winning service and support options in your region.